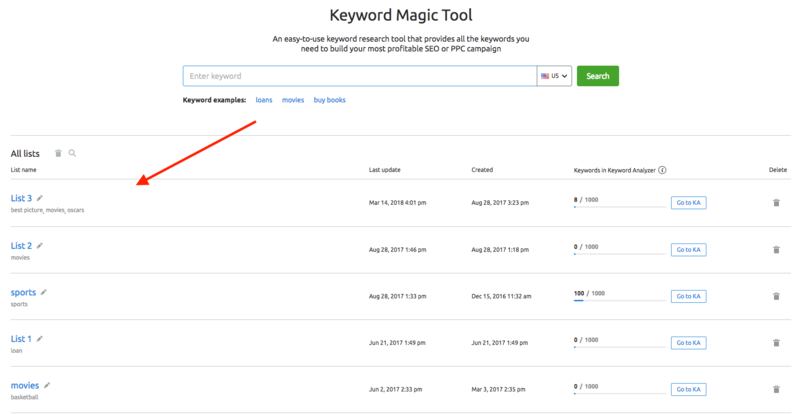 The Keyword Magic Tool gives you a powerful resource to analyze an entire search market, study niche subtopics, and groups, and save your research as you go. From small business website owners to enterprise agencies and corporations, this tool provides you with insightful data to use and get ahead of your competition. To get started, simply enter a keyword you want to analyze into the search bar. The keyword entered in the search bar is your seed keyword (1), here you will select your database. From your seed keyword, the tool will generate a complete listing of all the various related terms in the table below (2). Depending on the popularity of your seed keyword, the table could show millions of related keywords in the table. To the left of the main table are the groups (3) generated by the Keyword Magic Tool. With the tabs above the table, you can run another report with a new seed keyword that will remain saved into a List (4). Each List can hold up to 7 seed keywords and has the ability to send up to 1000 keywords to the Keyword Analyzer. Paid SEMrush users have access to 50 lists, while a free user only has 1 list. There are a few modifiers that you can use to get more specific results from your seed keyword. 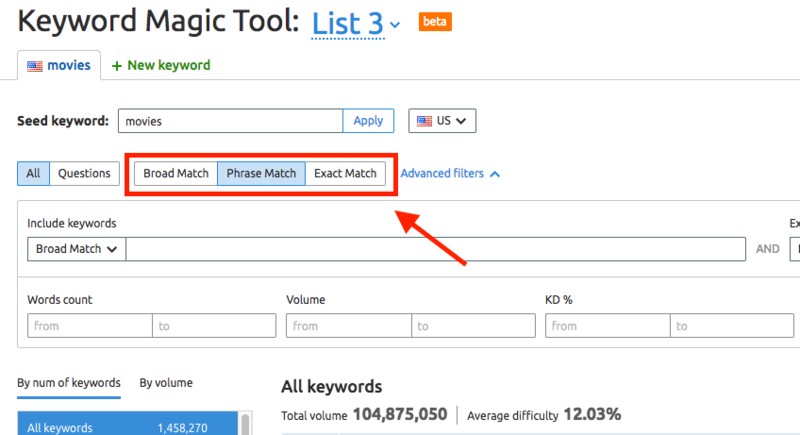 As you query your seed keyword, you can choose Broad Match, Phrase Match, or Exact Match. Broad Match is the default report and it will show all keyword ideas for the seed keyword in all found forms and without the exact order. This modifier returns the largest amount of keywords. Phrase Match provides keywords in the exact same form as the seed keyword but in various orders. This will exclude variations of your seed keyword (-ing, -ed, -s, etc) from your results. Exact Match shows all keyword ideas for the seed keyword in the exact same form as the seed keyword and in the exact order. Another way to modify your search is with the Questions button. Hit this button to only see keywords in the form of a question. Question-based keywords can significantly help you build out a search marketing plan. Common questions can be a great way to find ideas for blog posts, campaigns, featured snippets to target and more. When you target a question-based keyword, you have something more specific to do: provide a direct answer. Common question types that make for good content include “how-to’s”, “what is the difference between x and y,” and “where do I find x?” All of these types of questions are very common for search engine users and therefore, can be great sources of ideas for SEO-focused content. In the menu to the left will be the suggested groups of related topics. Groups are organized by shared added keywords, so you can use groups to explore the subtopics around your main keyword. You can order the groups in this list by the number of keywords in the group or the amount of combined average monthly search volume between the keywords in the group. Use groups for identifying niche topics and generating ideas for PPC campaign ad groups. To see the total search volume of a group, choose “By volume” instead of “By num of keywords” above the group table (1). To hide a group, use the eye icon beside the group name (2). To go even deeper into a niche, you can click on a group’s blue arrow and explore subgroups. These work the same way as groups. You’ll be able to see the total number of keywords and the total search volume per subgroup, and have the ability to hide a subgroup from your total batch with the eye icon beside the subgroup name. At the moment, there are three levels of subgroups. So you can enter your seed keyword (seed), explore your first level group (chia), second level subgroup (benefits), and third level subgroup (health). 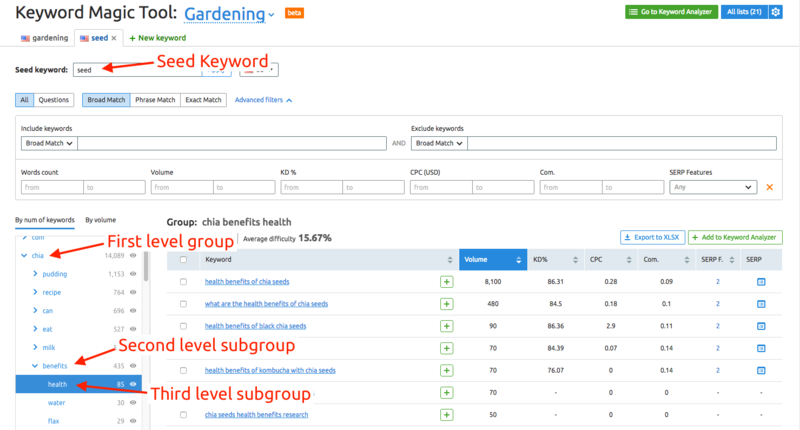 If you’re building a PPC campaign around keyword groups found in this tool, you may want to explore subgroups to get a more hyper-specific set of keywords to target with each group. 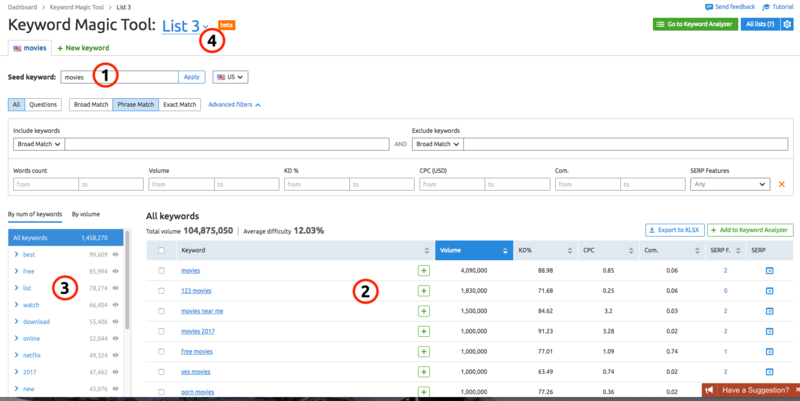 Browse through the different groups and you’ll notice the Total Volume and Average Difficulty metrics above the table that will adjust to reflect the keywords you’re looking at. Total Volume represents the combined average monthly search volume of all the keywords in the current group you’re analyzing. Average Difficulty shows the average keyword difficulty among all the terms in the selected group. This gives you an estimate of how much traffic each subcategory is worth and how hard it would be to rank your website for the keywords in that group. Groups with high Total Volume and low Average Difficulty should be more valued and identified as topics to target with content marketing or SEO efforts. Find the “show filters” link to reveal the available filters to narrow your report. You can filter by including/excluding keywords, word count, or by a specific metric. In the same way, you can query your seed keyword with match types, you can also add additional include/exclude keyword filters using Broad or Exact Match to specify the filter. Exact Match will include the exact match of the phrase ‘buy fresh’ with the same words order. So you will get ‘buy fresh bananas’, ‘where to buy fresh bananas’, ‘buy fresh bananas in New York’, etc. Broad Match will include all forms of the words 'buy' and 'fresh' and will suggest variations of the word order. So you will get all keywords from exact match plus ‘‘buy the freshest banana’, ‘buy bananas fresh’, ‘buy super-fresh bananas in New York’, etc. The same logic is implemented in the Exclude filter. After adding any specific words to include or exclude, you can also add filters for any of the other metrics: Word Count, Volume, KD, CPC, Competitive Density and SERP features. Word Count filtering make it easier to scan for long tail keywords. Cost-per-click and Competitive Density filters are useful for finding PPC campaign keywords. Volume and Keyword Difficulty filters will be helpful for prioritizing target keywords in a content marketing or SEO campaign. Finding keywords that trigger SERP Features is another great feature within the Keyword Magic Tool. With the SERP Features filters, you can filter the list of keywords and identify the exact keywords that trigger the various types of SERP Features. These SERP Features include Instant Answer, Knowledge Graph, Carousel, Local Pack, News, Images, Site Links, Review, Tweet, Video, Featured Video and Featured Snippets. With each keyword, you can view the SERP source with the SERP icon in the column second from the right. If your website is authoritative enough in the eyes of Google, your content could be chosen for a Featured Snippet result. Therefore, you can look for these targets by including filters for the specific Knowledge Graph results you want to take advantage of. You can add multiple SERP Feature filters at the same time to look for keywords that trigger more than one special result on their SERP. For example, some keywords will trigger a Featured Video result in addition to regular video results. Another example would be looking for keywords that trigger both Local Pack and Review results on the SERP. Excluding SERP Features is another way to prospect keywords to target with SEO because a results page with no SERP Features can be easier to compete on. To filter for only keywords with no SERP Feature, use the “none” option in the SERP Feature filter drop down. The Keyword Analyzer (available only with a paid subscription) provides a deeper analysis on up to 1,000 keywords at a time. You can use this feature to refresh metrics at any time to see if any SERP Features or top competitors for a keyword have changed since SEMrush’s last update. To add keywords to the Keyword Analyzer, highlight an individual keyword or group from your table and select the green “Add to Keyword Analyzer” button. Top Competitors, Average Difficulty, and SERP Features will be listed only after clicking on the Update Metrics button. Once clicked, you will be able to see the list of snippets that are in the top 10 results on the SERP for the keyword at that given time. The Update Metrics button allows you to refresh the metrics on any individual keyword in real time. Please note: Users are limited to 1000 keyword update metrics per day and 10,000 keywords per month. Just like the Keyword Magic report, you are able to exclude and include any of the keywords in your Keyword Analyzer. You can add individual keywords to your Keyword Analyzer by hovering over the given keyword and clicking the -> KW Analyzer button located directly to the right of the keyword. The Keyword Analyzer also gives you the ability to send certain keywords to your Position Tracking and PPC Keyword Tool campaigns set up in your Projects. Once you are in the Keyword Analyzer, you will see a tab in the top right labeled “Send to other tools.” After clicking on this button, you will be able to choose if you want to send all of your keywords to Position Tracking or the PPC Keyword Tool, or if you want to just send a selected number of keywords. In order for you to do this, you must first have a Position Tracking or PPC Keyword Tool campaign already set up. Related Keywords filter within Keyword Magic is perfect for finding different keywords that you can target with your website to help build up your overall search authority and bring more organic traffic to your site. Finding related keywords that are similar to the main keyword allows you the chance to slowly build up your authority for that keyword -- especially if the main keyword has high volume and intent. SEMrush Related Keywords are based on our related % metric and represents keywords that have less competition and thus give you a better chance of getting a higher ranking for a valuable main keyword. Casting a wide net with your keyword research can help you reach keyword niches that could have been ignored. Related Keywords can give you insight into other similar keyword suggestions. Here you can see after entering “winter coats” we can find that the word “women's winter coats” has a volume of 74000 searches per month (on average) and a related % of 45. Therefore, it could make a good addition to our hypothetical target list. Related keywords can range from things such as misspellings to important long-tailed keywords. As mentioned earlier, using these generally less competitive keywords to build up your search authority will help you eventually obtain the ability to target your main goal keywords. If you are analyzing a long tail keyword within the Related Keywords Report you will be able to see similar long-tail keywords that can be added to your Keyword List. The more long-tailed keywords that you have in your Keyword List, the more likely you are to have high search ranks because of the fact that these keywords are so specifically linked to your brand and content. Long-tailed keywords have less competition than your normal generic keywords, allowing for a higher potential click-through rate which can ensure that your keyword list is getting the highest possible ROI. Using related keywords can not only help in building out your perfect keyword list but it can also help to spark new content ideas for your site’s SEO optimization. Related Keywords can be perfect for generating on-site content ideas for any new blog or landing page that you are creating for a future campaign. If you are looking to draw up a landing page for a new PPC campaign focusing on newly released snowboard boots, the Related report can help you determine what other search terms users are searching for when it comes to your main keyword. Using these related keywords within your actual landing page content can actually help increase your natural SEO ranking in the eyes of Google and Bing. Content is becoming key in the eyes of Google, so coming up with creative ways to add key related keywords to your content can help you blow away your competition. One of the hardest aspects of any keyword research is understanding exactly what your target audience is going to be searching for. Understanding the intention of your users search queries can be key in building up your perfect keyword list to blow by your competitors. Some of your competitors may not be using their keyword research strategies to account for one of the most common keyword opportunities: popular misspellings. Using the Related Keywords you can see all of the most common misspelled keywords that relate back to your main targeted keyword. By default, the report’s results are sorted by keyword related % in descending order. You can also sort results by related %, volume, trend, KD, CPC, Com., SERP Features and results in SERP. You can then parlay this data to identify misspelled keywords that your competitors may not know about that you can go after. Let’s say you are running a PPC campaign with the focus on snowboards. Being that you are in the market of sunglasses, Burton is undoubtedly going to be one of your stiffest competitors. By entering their brand name, “Burton” in the search bar, you will be able to see the most common misspellings of their brand. Then, you can use these words as targets in a PPC Campaign. This way, when searchers mistype your competitor in the search bar (which happens more often than you’d think), your ad will appear above the organic results. Located in the top right of the Keyword Magic Tool dashboard is a button labeled All Lists. When you enter your first seed keyword in the Keyword Magic Tool, it will be saved into a list with the other seed keywords you query in neighboring tabs. Lists allow you to view any previous keywords that were searched, along with the name of the list, the Keyword Analyzer limits, the date it was created, when it was last updated and the ability to delete that specific list. After you’ve done your analysis of all the groups and keywords, you can export your entire batch to an XLSX file with the green export to XLSX button above the table to the right. Please keep in mind that in order to export your data you need to be out of the My List section of the Keyword Magic Tool. If you want to export multiple groups (but not every group) in one file, use the eye icon to exclude the groups you don’t want from your full batch. After excluding every group that you don’t want to export, hit “All keywords” again at the top of the group menu and export the full table. When exporting the full table, you have the choice to export with or without groups. When you export with groups, the keyword groups will be formatted as separate tabs within your excel file. Please note that an export from your “All keywords” table will not include the other seed keywords in your list. Only the keywords from your current seed’s table will export. If you want to export keywords from multiple seed lists, you will have to export from the Keyword Analyzer. What Does SERP Features Mean For My Keywords? What databases are available in the Keyword Magic Tool? What are Lists in the Keyword Magic Tool? How is Related % Calculated?